In my 23 years at POST, I’ve seen few transactions as sophisticated and innovative as the deal we just closed in collaboration with the McCrary family, owners of Big Creek Lumber. The Mercury News recently published an article outlining the many benefits of this surprising partnership, and we’re excited to share more about it with you below. This project in particular illustrates so many positive aspects of our work – innovation, creativity, partnership, forward thinking, and tenacity to name a few. It takes all of this and more to enable the positive impacts to our local environment, economy and communities for which POST is known. Through a series of complex, interwoven transactions, we’ve conserved two properties totaling 937 acres of redwood forest valued at $11.7 million. We protected pristine habitat for endangered species, while simultaneously ensuring a supply of sustainable lumber from an environmentally sensitive local company. It’s a win-win for all and an example of how the conservation and timber industries can work together to achieve shared goals. • 937 acres of redwood forest protected from development in perpetuity! • The first-ever working forest conservation easement in the region to be collaboratively negotiated between a conservation organization and a timber company ensuring a sustainable, local timber supply for Big Creek Lumber. • Critical habitat for endangered species (like the marbled murrelet) protected forever, which will one day be incorporated into Butano State Park. • Funds from POST and the McCrary Family made this deal possible and were supported by significant grants from the Gordon and Betty Moore Foundation and the California Coastal Conservancy. 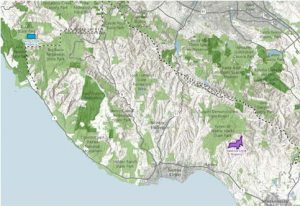 The 617-acre Valencia Creek property was owned by the Cal Poly Corporation and had been managed for timber production with the help of Big Creek Lumber for decades. They had maintained an environmentally sensitive approach to logging this property by only cutting the amount of timber regrown from previous harvests. As the property was put on the market, Big Creek Lumber was interested in ensuring the land was not subdivided and remained a working forest. The McCrarys pride themselves on a long history of progressive, environmentally-sensitive forestry practices, and this property’s previous history of management provided an important local and sustainable timber resource. Its productiveness and established forest road network lends itself well to continued forest management, while still providing for open space, clean water and wildlife habitat. 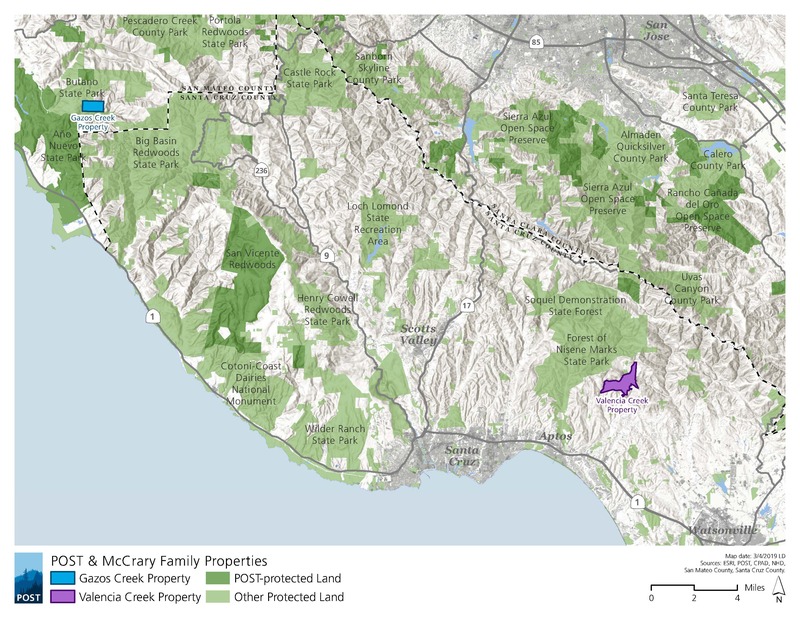 After acquiring Valencia Creek from the Cal Poly Corporation, POST transferred ownership to the McCrary family subject to a working forest conservation easement — the first agreement of this kind in our area to be collaboratively negotiated between a conservation organization and a timber company. The easement requires that all landowners— present and future — continue to manage the forest land to high standards. In turn, the McCrary family sold their Gazos Creek property to POST under extremely favorable and generous terms. These 320 acres of mature second-growth forest provide important habitat for endangered species like the marbled murrelet and protection of an important watershed. The property is adjacent to old growth redwood forest in Butano State Park and will allow for increased habitat connectivity in the area. Our friends at the The Sempervirens Fund will assist by assuming the management responsibilities of the property until it can be transferred to the state and incorporated into Butano State Park. What made this deal so complex was that it was dependent on the acquisition of two pieces of independent property. Navigating the complexities of a transaction like this exemplifies the creativity and deep expertise of POST’s staff that has been honed by over 40 years of doing this work. It’s a complicated transaction that results in a win-win for our everyone involved and for our region as a whole. Optimizing land use on each property would not have been possible without the close cooperation of the conservation community and the timber industry. For me, this is a very exciting aspect of this project. Working with the McCrary family not only made good environmental sense, but it has provided economic security for an important local business. This project recognizes Big Creek’s thoughtful, careful approach to forestry and highlights the values that we all share – a love of redwood forests, a desire to keep them healthy and thriving, and a devotion to the safety, beauty and health of the communities that surround these beautiful mountains. It’s an inspiring approach to a complex challenge, and one that is made possible by the many donors, funders and supporters of all of the organizations involved. I look forward to seeing what we might accomplish together in the future. The entire transaction was made possible by funding from the California State Coastal Conservancy, the Gordon and Betty Moore Foundation and the McCrary Family.